I awoke at 4:20 am and took that first step of faith for a month-long trip down south visiting family, friends and business associates. I had planned to leave around the end of January after our corporate and personal tax returns were all filed, but the various snowstorms in our area and the cold fronts in AL, GA and northern FL did not provide temperatures to warrant wanting to leave home. As the winter wore on in Central Virginia, my mind began telling me that I was crazy to think I could make a trip that would end up being over 2000 miles. After all I've lost a lot of strength in my hands and arms ... and my joints went on strike quite awhile ago (although we are in negotiations for a healing). God says that "the joy of the Lord is our strength" so I kept reminding myself that I didn't have to rely on my own strength for this trip. My sweet husband encouraged me and when all the storms seemed to have passed by ... I decided a week ago to make my move today. It's so easy to allow health challenges to rule our lives. It can become a habit that makes it easy to forget that with God all things are possible. With spiritual motivational tapes on the seat beside me, I was on the road after an omelet breakfast with my sweetheart. Sad to leave, but excited about the people I was going to see, my mind could no longer fool me into thinking there was anything I could not accomplish. I knew God was with me. After 130 miles were behind me, I had a thought that I'd left my overnight satchel in the kitchen. It had all of the most important things in it, like the book I was reading, toiletries, makeup and my Hallelujah Cream, which is Tei Fu Massage Lotion. Whenever I hike, take a long walk, or do a lot of driving / riding, Tei Fu takes away the soreness or pain in 10 minutes, and I'm shouting Hallelujah! No need for pain pills when there's something so simple. I pulled over, looked in the trunk, and confirmed that thought - no overnight drawstring bag. My first question was: Why did it take me so long to think of it? I was two hours from home. What to do? Was God delaying me because of some accident ahead? Was I to turn around and go back home? How long would it take me to find and purchase all that stuff? 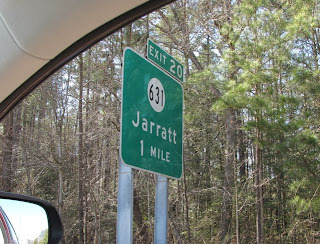 I took the next exit and called my husband from the Slip-In Food Mart in Jarrett, Virginia. He prayed with me and then said he'd meet me halfway, so I headed north 64 miles for the rendezvous. I was definitely tempted to begin complaining and whining and that would've led to self-condemnation, but instead I kept thanking the Lord for the adventure and a second goodbye with my husband, as I trusted totally in Him for the reasons behind the delay and extra miles. If you can squelch that first negative griping vocal comment that is screaming in your brain to be released, and begin to praise the Lord for His direction of your steps, you'll keep your joy regardless of circumstances. I was delighted that this time I did the right thing! Sometimes I have to chase after it and strangle it after it gets out of my mouth. Not having cell phones, we agreed to meet at a designated exit. He arrived five minutes after me, driving up behind me with a big grin on his face. How blessed I am to have such a grand man to call my own! We popped into a Tropical Smoothie to get one for the road since it was noon and I knew he didn't have food in the car like I did. 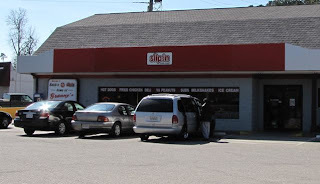 After a bit of snuggling at the table and a few kisses in the parking lot, we parted with smiles and blown kisses. At this point, my special friend, Christina, would say, "awwwhh." She says that anytime somebody is being romantic. I have to admit, if the role were reversed, I would not have fared as well on my attitude. I'm not that flexible in my work schedule and I know I wouldn't have been as pleased as Randal was to make the trip. After I emailed him that I had arrived, he told me he was keeping the smoothie cup to remind him of "that neat event" and that he just loved the opportunity to see me again, and that he praised the Lord all the way for making that happen. Hmm .. well, I guess I had one clue as to why God allowed it, eh? My gas light came on 11 miles from the exit I had taken previously to call home, so I went back to the same place and had a few grins as I pumped gas. It was like somebody had pushed Rewind and Replay on my day, but all was well because I made the choice to see it as good. Romans 8:28 says ALL things work for good (so today was included in 'all') and Proverbs 16:9 says God directs our steps. Keeping my mind in alignment with what God says made the day look delightful in the midst of troubles. When I took the exit for the hotel this evening, there was a homeless man with a sign at the corner. I'm always challenged with what to do in these situations because there are many reasons not to "do something" since they may buy alcohol or drugs. Luke 6:30 came to mind where Jesus says, "Give to every man that asks of you." I thought of the sandwiches I had packed for the trip. Since I had that smoothie I hadn't eaten a bite, so I asked the Lord to hold the light on red as I dug in my box for one of my fat sandwiches on whole-grain seeded bread. It made me smile just thinking about how healthy it was. I rolled down my window and asked if he wanted a sandwich. He said, "God bless you" and I replied with the same message. WOW God, that was cool! I had been listening to a CD on the fruits of the Spirit and had chosen Love from the selection of fruits. I wonder ... was he an angel sent to see if I would simply hear the Word or choose to do it? When I checked in and asked about wireless in the room, the clerk said "the singles rooms don't have wireless." When I turned on the computer I was blessed to see my wireless symbol active. I had traveled 505 miles after seeing the sun rise before leaving ... and the sunset as I arrived. When I got to my room, I heard frogs down the bank behind me. I love frogs and hadn't heard any since September. They're loud enough that I can hear them in the room. Heavenly music to my ears. Some days God's favor just overtakes us! Praise You, Father! What a start! I am admire you Donna, how you handled this situation. I hope I will remember that when similarity happens. It's more how Randal handled it than me. And I've begun to tell myself that life happens all the time, but it's my choices on how I react to it that makes it good or bad. It's those first few moments when we make the choice of which way it's going to go.